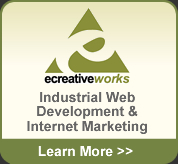 Ecreativeworks, based in Plymouth, MN with offices in Southern California build high quality websites for the Industrial Marketplace. We provide services such as, website design, database building, website development, ecommerce solutions, CMS (content management systems), RFQ carts, configurators, part number builders, content syndication and more for your industrial firm. Other services we provide are: Search Engine Optimization, Search Engine Marketing, Internet Marketing, Pay Per Click, Copy writing and Content Development to name a few that can benefit your industrial web presence. Ecreativeworks works with many different types of companies including: Industrial Product and OEM Manufacturers, custom and contract manufacturers, distribution centers (resellers & dealers), consumer products companies and professional organizations. We are sure to have a creative solution that will work for your online needs.